This box was named March West Junc together with March Whitemoor Junc and March North junc signal boxes controlled the triangular junction into Whitemoor yard and the Wisbech line and the GN&GEJR line to Spalding. 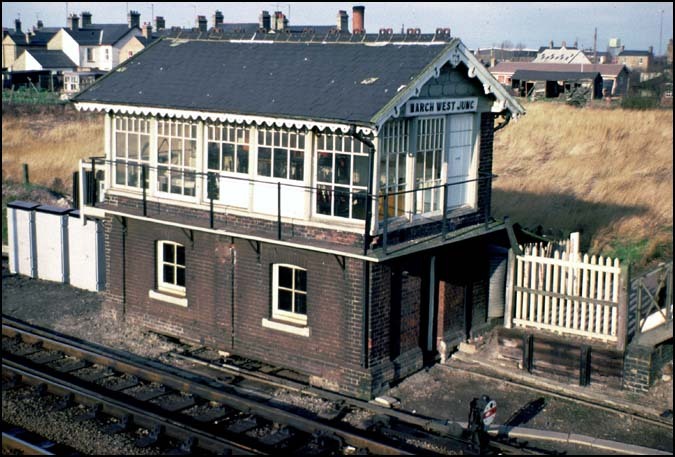 Although some signal boxes in March are still in use in 2010, This signal box was closed on 29th November in 1987. The March East box taking over the points and signals from this box. The footbridge I took this photo from is still in use. At the other end of Whitemoor yard was Twenty Feet River signal box on the March to Spalding line.